Carefully remove the cardboard components from their punchboards. The Wheelbarrow is composed of the body and the wheel. First fold up the front part of the body, then the sides, and finally, the back side. Then insert the front wheel. 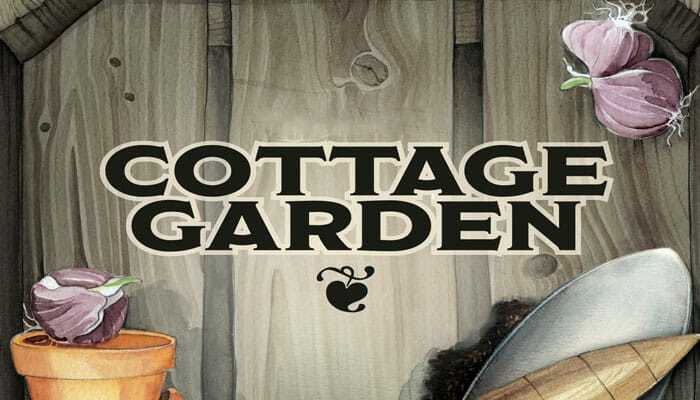 In this game, you compete in the art of gardening: planting two Flowerbeds at a time with different flowers. When there are no more free spaces visible on a Flowerbed, it is completed, scored, and replaced with a new unplanted one. You receive points for all visible Flower Pots and Plant Covers on your completed Flowerbed, and record these points on the corresponding scoring tracks. In the final stages, you will only invest your energy in the most promising Flowerbeds. 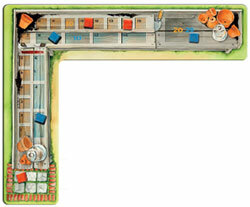 Place the Nursery in the middle, showing the side for the appropriate number of players (one side for 1-3 players, the other side for 4 players), shown on the starting Gardener space on each side of the board. Leave enough space on one side of the Nursery (about the same amount as the game board) for the Flower Tiles. Randomly fill the 16 spaces in the Nursery with the Flower Tiles (1 tile per space). Place the remaining 20 Flower Tiles randomly in a "queue" next to the Nursery. Place the Wheelbarrow at one end to mark the start of the queue. Each player receives a Planting Table on which he places 3 orange and 3 blue Scoring Cubes on the starting space. 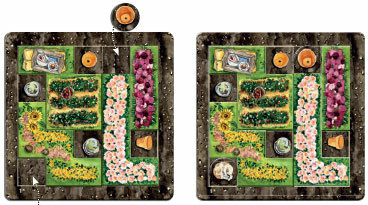 Then each player randomly draws 2 Flowerbeds, placing them next to his Planting Table, with one showing the light side and one showing the dark side. In addition, each player takes 2 Cats. Place the remaining Flowerbeds with the light sides showing, along with the Parasol, the remaining Cats, the Flowerpots and the Beehives on the other side of the Nursery. Give the Gardener a value of "1" (with 1-2 players, use a value of "2") and place it on the starting space in the Nursery. All remaining components are returned to the box. Immediately following is the explanation for the game for 2 to 4 players. The solo rules are at the end of the rules (on page 11). Players take turns in a clockwise direction. The last person to have weeded a garden is the starting player. A turn consists of four phases, which are performed in order. 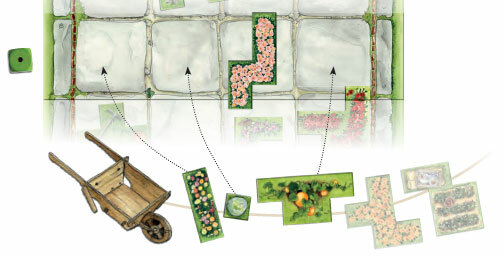 Check the Nursery spaces in the row or column (or diagonal in a 4-player game) indicated by the current position of the Gardener. (Let's call it the Gardener Row). 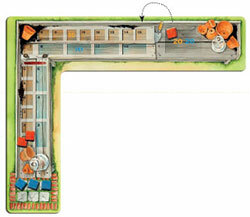 If the 3 or 4 spaces of a Gardener Row are empty, you must fill those spaces using Flower Tiles from the queue. Take the Flower Tile which is in the queue directly in front of the Wheelbarrow, and place it on the empty space of Gardener Row which is the closest to the Gardener. Push the Wheelbarrow ahead to the next Flower Tile in the queue. 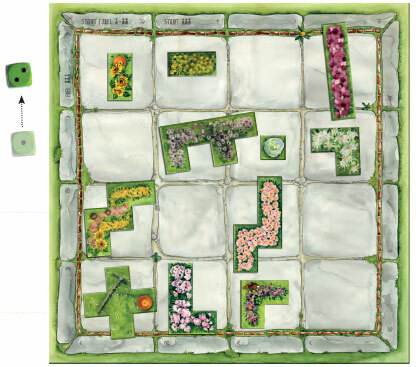 Then take that Flower Tile and place it on the next empty space of Gardener Row which is the closest to the Gardener. Repeat this procedure once or twice more, depending on whether 3 or 4 spaces are empty in the Gardener Row. In this example, three spaces in the Gardener Row are empty. This shows the order in which the Gardener Row is to be filled. If only 1 or 2 spaces of the Gardener Row are empty, you may give up one Cat in order to fill those spaces (as described before) with the Flowers Tiles ahead of the Wheelbarrow in the queue. You are only allowed to do this special action if you give up a Cat, returning it to the reserve next to the Nursery. Choose a Flower Tiles from the Gardener Row. Immediately place this Flower Tile on one of your Flowerbeds. In this example, you have your choice of the highlighted Flower Tiles. You may flip over and rotate the Flower Tiles any way you like. 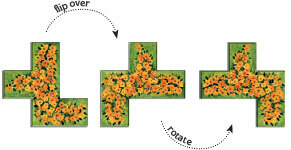 You may not place Flowers Tiles onto or overlapping other Flower Tiles. The Flower Tiles may not protrude over the edge of a Flowerbed. Flower Tiles that were placed may not be moved on a later turn. They remain in their places until the Flowerbed is completed. You may cover spaces that show a Flowerpot or Plant Cover, but you are not required to (and you should try to avoid doing this too often). You may not cover Cat and Flowerpot tokens. Instead of taking a Flower Tile from the Nursery, you may take a Flowerpot from the reserve and place it immediately on an empty space on one of your Flowerbeds. This space is now occupied. (Youmay not keep the Flowerpot in reserve for use on a later turn). This Flowerpot from the reserve will count in the Flowerbed's score (see the next page). /IS such, the Flowerpots are more than just a way out of a less-than-ideal situation. The Cat completes the Flowerbed in this example, but it doesn't bring you any additional points. Additionally, you can always place Cats from your reserve on an empty space of one of your Flowerbeds. The cardboard token covers exactly one space on a Flowerbed in the same manner as the smallest Flowers Tile. The cats, however, do not score any points. You may, at all times (even when it is not your turn)}, take a Flower Tile provisionally from the Nursery to see how it fits on your Flowerbeds. Place the Parasol on that tile's space in the Nursery, so that you know which space you must return the tile to when you are finished. After you have returned the Flower Tile, place the Parasol to the side of the Nursery again. To complete a Flowerbed, all spaces without Flowerpots or Plant Covers must be covered. Every Flowerbed completed at the end of the planting phase is scored. Your Planting Table has 2 scoring tracks, one for the Flowerpots (spaces numbered 1 -15), and another for the Plant Covers (spaces numbered 2-14, by twos). Move exactly one of your Orange Cubes on the Flowerpot track as many spaces as to the number of Flowerpots visible on the Flowerbed you are scoring. (Each Flowerpot scores 1 point). Covered Flowerpots do not count. Move exactly one of your Blue Cubes on the Plant Cover track as many spaces as to the number of Plant Covers visible on the Flowerbed you are scoring. (Each Plant Cover scores 2 points). Covered Plant Covers do not count. In this Flowerbed you see just spaces that are not yet covered but have either a Flowerpot or a Plant Cover printed on them. This Flowerbed is considered completed. This Example of a completed Flowerbed brings you 2 points for one of your Orange Cubes and 4 points for one of your Blue Cubes. The right bed brings you 3 Points for Flowerpots and 2 for Plant Covers. You can freely choose which of your Orange or Blue Cube to move. Should you reach the target space "20" before you have moved the cube all of the spaces, you forfeit the remaining spaces. (YOU may not distribute them between different cubes of the same color). Using a Cat, it is possible for you to complete both Flowerbeds in the same round (see Planting Phase of your game turn). In this case, you may score the Flowerbeds in the order of your choosing. You do not receive and points for the Cat. Tip: Reaching the target space on the track multiple times is so important in this game that occasionally you may have to forfeit some spaces when moving there. The first player to get his first Cube to the target space on either track receives the 2-beehive token as a bonus. The second player to do so receives the 1 -beehive token. At the end of the game, each beehive is worth 1 point. It is not possible for the same player to receive both tokens. Whenever you cross the red line with the mice on your scoring tracks while moving an Orange or Blue Cube, you receive a Cat from the reserve. You may use it immediately on a Flowerbed or place it in front of you for later. If you moved the last of your three Orange or Blue Cubes from the starting space, you receive for each a Flowerpot token from the reserve, which must be placed on a Flowerbed immediately. This could complete the second Flowerbed. Score it as described above. After a Flowerbed is scored, place all Flowerpot and Cat tokes from that Flowerbed back into the reserve next to the Nursery. Place all Flower Tiles from that Flowerbed in any order at the end of the queue. (The end of the queue that is not marked by the Wheelbarrow). Flip the now-empty Flowerbed to the other side (light to dark or dark to light) and place it in the middle of the table. Take the other Flowerbed from the center of the table and place it (without flipping it over) next to your other Flowerbed. You may only have two Cats in your personal reserve at the end of your turn. If you have more than two, place at least as many Cats on empty spaces of your Flowerbeds until you meet the requirement. If you complete a Flowerbed, score it as described above. At the end of your turn, you must move the Gardener Die located on the edge of the board one space in the direction of the arrows (clockwise). Whenever the Gardner reaches the target space, you must increase the number on the die by 1. In a 2-player or 4-player game, the target space is the same as the starting space. When the Gardener die is turned to "6", the final round begins immediately. In a 3-player game, the target space is two arrow spaces before the starting space. 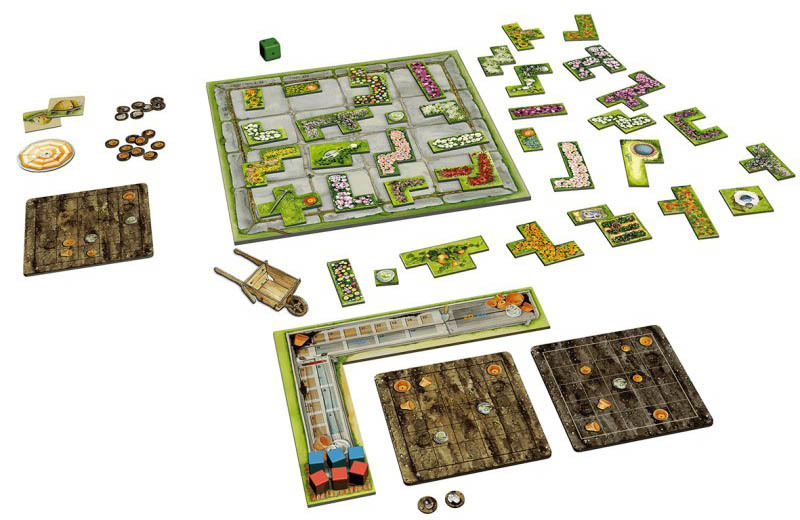 In the four-player game, there are Gardener spaces not only along the rows and columns, but also on the diagonals. The Gardener spaces have different arrow symbols. 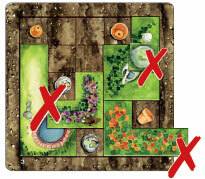 Now you must give up all Flowerbeds with two or fewer Flower Tiles (the number of other tokens does not matter). You must now continue playing until you have completed any Flowerbeds you have left. Take your turns in the same way as before, but with the following rule changes: Before each turn you lose 2 points by either moving 1 Orange Cube two spaces back on its scoring track or 1 Blue Cube 1 space back (it is also allowed to move a cube in this way back to its starting space). If you do not have any more Flowerbeds at the start of your turn, you only perform the Gardener Phase. You do not lose any more points. If your Cubes are all in the fields 0, 1 and 20 of the point track, you are forced to move the Cube back from the 20 space. Instead of losing only 2 points, you lose 5 or 6 points! Exactly this situation, two orange cubes on space 1, the orange cubes from the target space points with an arrow to the "15" space. Whenever you complete a Flowerbed, you remove it from the game. You do not gain a new Flowerbed. Through moving Cubes backwards on the point track and then subsequently scoring a Flowerbed, it may happen that the red line is crossed repeatedly or the starting space of the track is empty again. In these cases, the bonuses are awarded again. Note that you will not get a Cat when your Cube is moved backwards across the red line! If you score a Flowerbed in the final round, you can use these bonuses to complete and score your second Flowerbed, if you have one. The game ends when all the Flowerbeds have been removed from the game. Total your points. The Orange Cubes are worth 1-15 points according to their position on the track, or 20 points if they are on the target space. The Blue Cubes are worth 2-14 points (by twos) or 20 points if they are on the target space. Each hive is worth 1 point. Cats in your reserve are worth nothing. The player with the highest score wins: If a tie, the tied player with more Beehives wins.